English: Spotted-backed weaver; black-headed weaver, V-marked weaver; French: Tisserin gendarme; German: Textorweber; Spanish: Tejedor de la Villa. physical characteristics 5.9-6.7 in (15-17 cm); female 1.1-1.5 oz (31-43 g), male 1.1-1.6 oz (32-45 g). 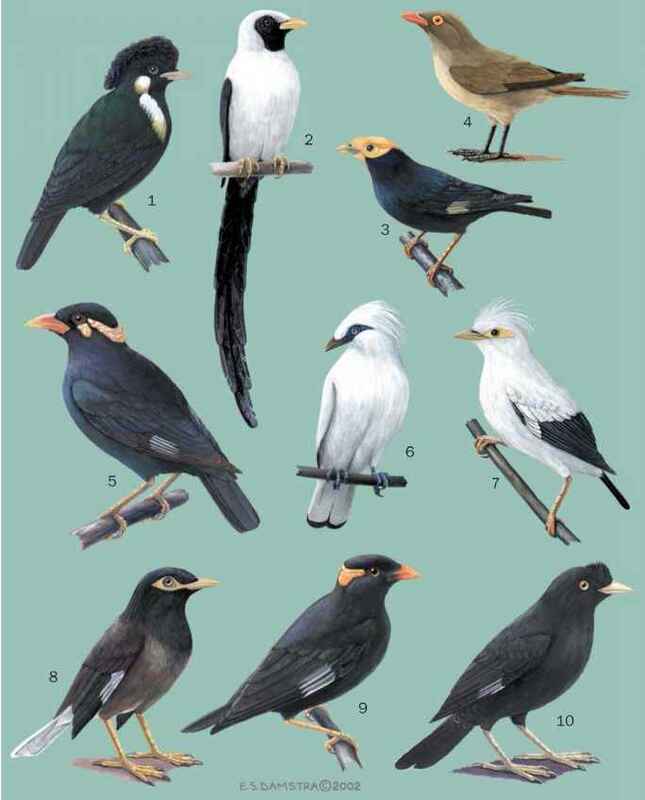 Breeding male has head black; forehead yellow in southern birds, and extent of black on throat and breast varies. All populations have upperparts yellow spotted with black, underparts plain yellow. Bill black, eye red. Female and non-breeding male upperparts dull olive, eyebrow, throat, and breast yellow to buff, belly whitish. Bill brown; older females may have red eye. During breeding season, female more yellow on underparts. Juvenile like female, eye brown. Senegal east to Somalia, south to northern Namibia, northern Botswana, eastern South Africa. Introduced to Haiti, Dominican Republic, Puerto Rico, Mauritius, and Réunion. Open wooded areas; in forest zone, in clearings and secondary growth, cultivated areas. Gregarious, in flocks when foraging and forms large roosts, often with other weavers. May be nomadic in dry season, and possible regular movements in some regions. Varied diet includes seeds, insects, flowers, nectar. Forages on the ground or gleans on vegetation and tree trunks. Colonial, polygynous. In central Africa often in large mixed colonies with Vieillot's black weaver (Ploceus nigerrimus). Nest is oval with entrance below, may have a short spout. Woven by male, who displays hanging below nest, fluttering wings, and calling. Breeding varies regionally, may continue throughout the year in central Africa. Lays two to five eggs. Incubation 12 days, fledging 17-21 days. Female alone incubates, male may feed nestlings. Often parasitized by Diederik cuckoo. Not threatened, very widespread, common in human-modified habitats and often abundant.